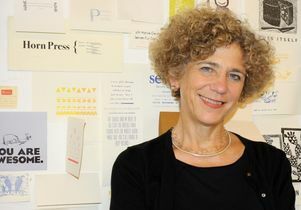 Johanna Drucker, UCLA professor of information studies, received an honorary Doctor of Fine Arts Degree at the 167th Commencement of the Maryland Institute College of Art on May 16. The honorary degree was given in recognition of her lifelong work in the history of the written word, typography and digital aesthetics. Drucker is internationally known for her work in digital humanities, experimental poetry, fine art, the history of graphic design and typography. She was elected to the American Academy of Arts and Sciences in 2014. Learn more in the UCLA Newsroom story, The latest from digital humanist Johanna Drucker.